Exactly how personal is your personal relationship with Jesus? Many believers agree that God made us for relationship with Him, but they may not be aware of just how deep and satisfying the friendship can be. Come alongside author Cynthia Bezek as she shares her struggles and successes in learning to connect with God. In this six-week Bible study, you'll discover soul-satisfying intimacy and great joy you never could have imagined possible. Draw near, grow deeper, and watch your life transform as you learn to walk more closely with God through prayer. "Prayer does not come easily and naturally to everyone. 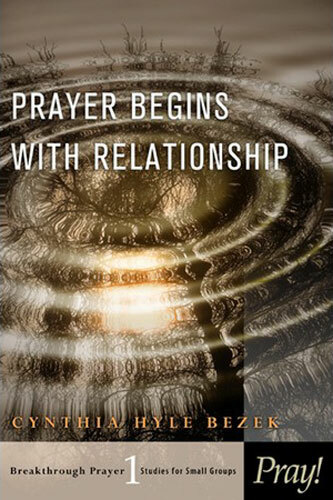 Cynthia Bezek, the author of this book, recognises that as she shares her struggles and successes in learning to connect with God. Written as a six lesson or six week study guide, `Prayer Begins With Relationship' explores the idea that struggles with prayer can be common, that we don't like to talk about disappointing experiences because it exposes our weakness and that if we change our thinking and understanding about what prayer is and knowing who God really is, it can change our attitudes, expectations and emotions and make our devotions more fulfilled. This is a very true to life book. The author records her personal life experiences and her response to them, talks about communication in a real sense, connects with the reader on how they perceive God, sets out points for consideration and allows space for personal reflection. It is also a very well presented and practical book. I enjoyed working through it and noting helpful pointers.